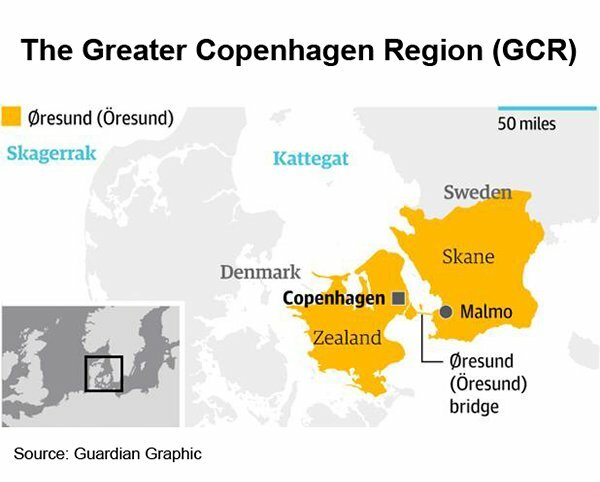 Highly regarded as one of the greenest domains on Earth, the Nordic region is a best- practice case for how national or regional commitment to a green economy can earn a global environmental reputation. Greater environmental focus on traditional industries such as fisheries and forestry, coupled with developments in efficiency and improvements in sectors such as renewable energy, smart cities with sustainable water and waste management, smart buildings and green transportation, has made the Nordics an excellent partner in the development and deployment of fast-growing CleanTech businesses. 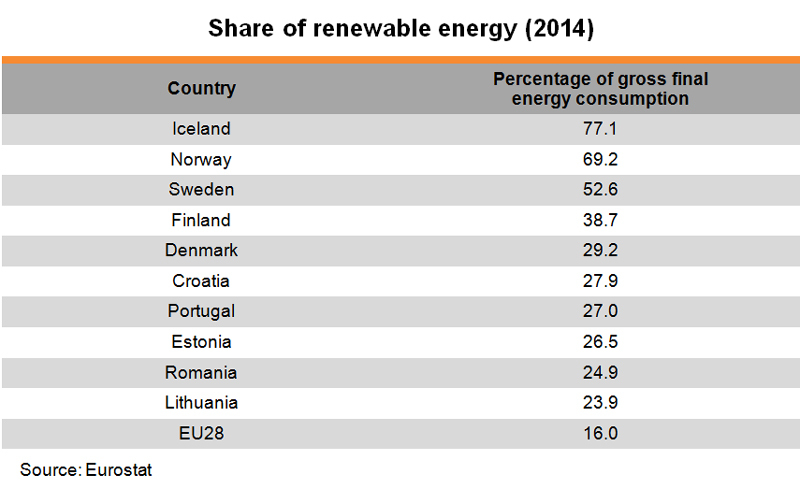 The Nordic region  leads Europe in the use of renewable energy. 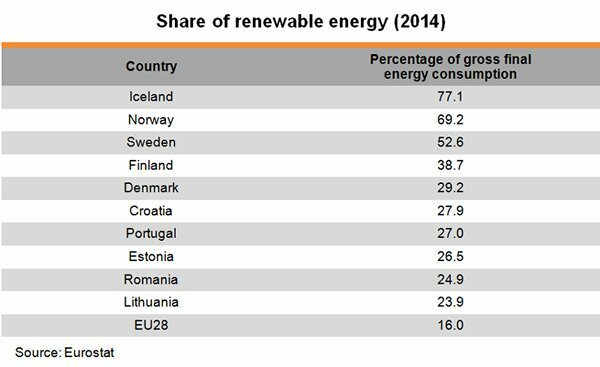 According to the latest available statistics, in 2014 renewables made up 77.1%, 69.2%, 52.6%, 38.7% and 29.2% of gross final energy consumption in Iceland, Norway, Sweden, Finland and Denmark, respectively, compared to the EU average of 16%. Major sources of renewables in the Nordic region include wind, waves, tidal, solar, geothermic, hydroelectric, biomass and biofuels. With four out of the five Nordic countries – Iceland, Norway, Sweden and Finland – meeting their 2020 renewable-energy obligations by 2014 (each country has a separate target in terms of percentage of gross final energy consumption), and committed to the belief that others can follow suit, the region is keen to promote its renewable-energy technologies and applications to the world’s major energy consumers. 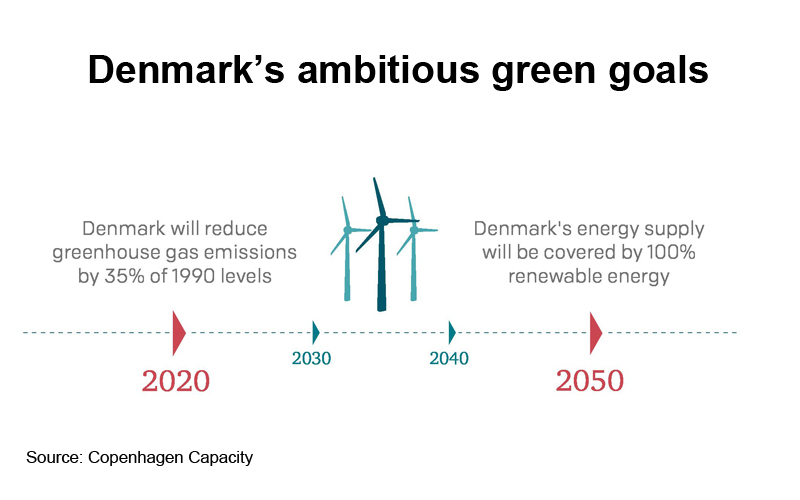 Although Denmark is still slightly behind its 2020 renewable-energy obligations (0.8% behind a target of 30%), it has committed to an ambitious goal to develop its capital and largest city, Copenhagen, into the world’s first carbon-neutral city by 2025, and to weaning the country off fossil fuels in favour of 100% renewables by 2050. Already able to meet its domestic electricity demand by wind power, Denmark exports power to its neighbours such as Germany, Norway and Sweden. As forerunners in green energy, many Nordic CleanTech companies have shown interest in securing partners and market opportunities to cash in on Asia’s growing demand for renewables, while Asian countries are pushing the development of renewable-energy options such as biomass, solar and wind power to reduce their reliance on fossil fuels. While renewable-energy resources may vary from country to country, China, the world’s largest energy consumer since overtaking the US in 2010, presents a tremendous opportunity for Nordic CleanTech companies. Given China’s large agricultural sector and rich hydro resources, companies specialising in biomass power generation, hydro-power turbines and equipment, flood-control systems, and urban planning are likely to be in high demand in the country where urbanisation is seen as key to fast-tracking economic growth and improving living conditions as rural to urban migration continues. Home to nearly 4 million inhabitants and the Nordic region’s largest recruitment base for highly-skilled employees, the Greater Copenhagen Region (GCR), a metropolitan area spanning Eastern Denmark and Skåne in Southern Sweden, offers the best foreign direct investment (FDI) strategy among Europe’s mid-sized regions (between 1.5 and 4 million inhabitants) in fDi Intelligence’s European Cities and Regions of the Future rankings 2016/17. With close links to Continental Europe, the Nordics and the Baltics, the GCR provides not only ready access to a market of more than 100 million consumers, but also to a cluster of high-level companies with strong competencies in renewable energy, waste and water management, recycling and upcycling solutions that make the GCR a frontrunner for green investments and innovation. Boasting an ambitious goal to become a leading international hub for investment and knowledge capable of competing with the most successful metropolises in Europe by 2020, the GCR offers international investors world-class research facilities and a creative business environment for a number of attractive high-growth technology sectors. For instance, through a unique collaboration between companies, universities and municipalities, Malmö Cleantech City, since 2010, has created a green network and promoted CleanTech entrepreneurship in Malmö. 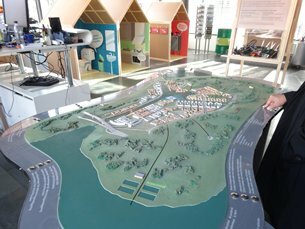 Aiming to become climate neutral by 2020 and 100% powered by renewables by 2030, Malmö, Sweden’s southernmost and third-largest city (after Stockholm and Gothenburg) has been successfully transformed from a polluted shipbuilding centre into a CleanTech hub boasting a high concentration of CleanTech players. 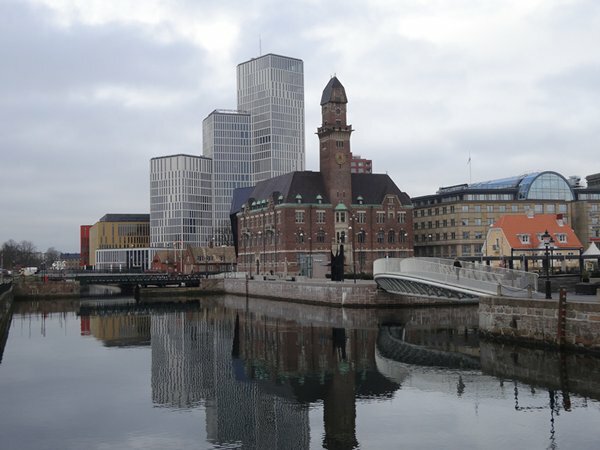 Malmö is often referred as the CleanTech capital of the Nordic region. 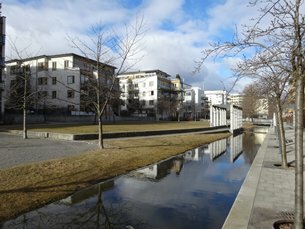 Thanks also to the city’s proximity to MAX IV, the next-generation synchrotron radiation facility, and the European Spallation Source (ESS), a state-of-the-art super-microscope generating new science and innovations for a sustainable society, Malmö is becoming a hotspot for leading life sciences and materials research. The industry cross-over between life sciences, CleanTech and smart-city solutions has already resulted in a number of projects and products including sensors on waste bins, smart grids, street lighting using LED, battery coating with nanoparticles for solar-energy generation and closed-loop recycled water showers. It is estimated that about 70% of China’s population, or about one billion people, will be living in cities by 2030, as more than 100 million people migrate from the countryside. 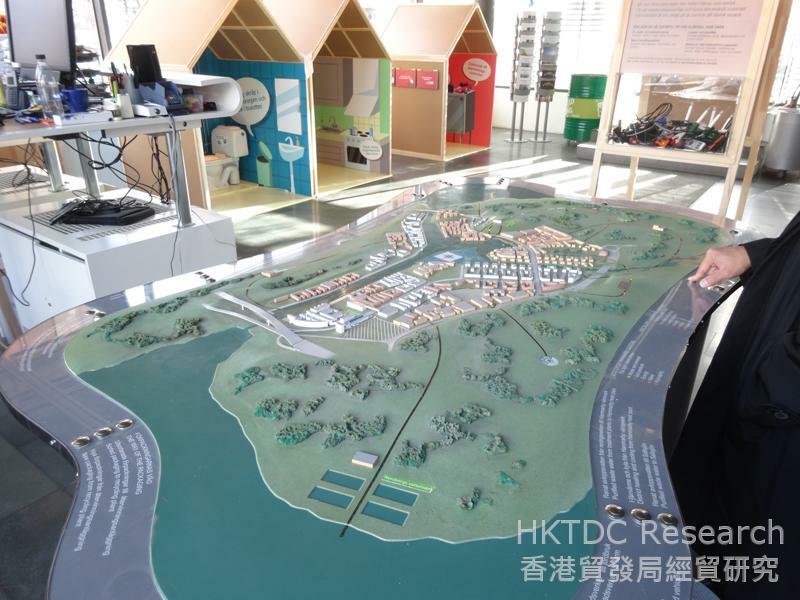 To cope with the high demand for efficient urban planning, smart-city development has become a key national policy and, in turn, a highly sought-after technology on the mainland. To ensure a sustainable yet holistic urban-planning approach, substantial government involvement is usually a prerequisite. This is especially true when old solutions for energy, water, sewage and waste must somehow be retrofitted and new, stricter environmental requirements call for completely new solutions. This, however, could create problems for private engagement and future marketability of the various projects. To this end, Stockholm – the first European Green Capital  – has a long historical track record of integrated urban management with ongoing credible green credentials and ambitious future plans. For instance, as the first eco-city district in Stockholm, Hammarby Sjöstad – as a symbol for the future of the Swedish capital – is one of the finest international role models of sustainable urban development. The initial idea was born in 1990 as part of Stockholm’s bid to host the 2004 Summer Olympic Games. When the bid failed, the city authorities decided to use the project as a pilot for environmentally friendly urban development in order to meet strong demand for sustainable housing. The development, expected to be completed in 2018, involves a mixture of private and public construction partners, which are designing and building individual housing units to accommodate 25,000 people in more than 11,000 apartments. It aims to achieving a 50% reduction in the overall environmental impact (waste, water and energy consumption) compared with a typical district built in the early 1990s. 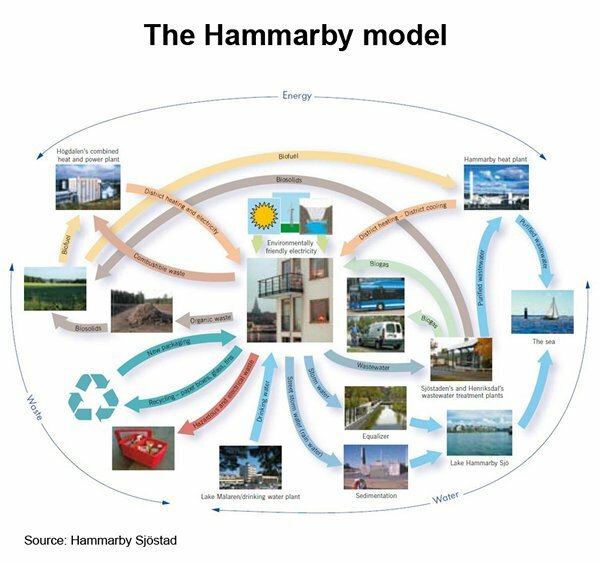 The green solutions being invented and applied in Hammarby Sjöstad are based on a closed eco-cycle, known as the Hammarby model, in which waste, water and energy consumption are minimised and recycling and upcycling are used whenever possible. In addition to installing solar cells and solar panels on several façades and roofs, treated sewage and combustible waste produced by the residents will be used as fuels in the production of the district’s heating, cooling, electrical power and biogas. Biodegrades, such as food waste and sewage sludge, will be used in the production of biogas for city buses and about 1,000 gas stoves. 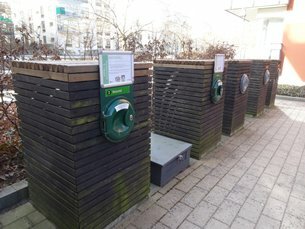 In a bid to free up space and reduce heavy traffic, Hammarby Sjöstad has adopted an automated waste-disposal system, with different refuse chutes, block-based recycling rooms and area-based waste-collection points being installed to help residents segregate and handle their waste at source. In the district, household refuse and organic food waste are collected at special waste inlets or disposal chutes located in courtyards, entrance halls and refuse rooms. Envac’s underground pipeline system transports the waste at up to 70 kilometers per hour through vacuum pipes to designated collection stations or suction vehicles. 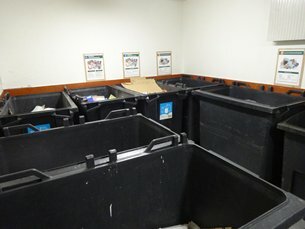 Other recyclables including packaging materials such as glass, cardboard and metals, are collected in conventional bins placed in a separate recycling room in the building. The stationary system transports waste through underground pipes to a collection station located fur afield. The mobile system uses underground tanks that are emptied later by suction vehicles. The district’s eco-friendly adaptation has resulted in substantial investments in transport. One ambitious goal is for most of the residents’ journeys to be made by cycling, walking or public transport, such as the Tvärbanan light railway that runs through the centre of the district and regular bus and ferry services that connect to the inner city of Stockholm. Other green-transport ideas such as car pools (ride-sharing services) and the use of electric vehicles are also being introduced or encouraged in the district to help minimise the environmental transport burden. Riding on the success of the Hammarby Sjöstad, the Stockholm City Council has since 2010 embarked on another world-class eco-city project – the Stockholm Royal Seaport. Situated in a former industrial and port area close to the city centre, the new smart city, when fully developed by about 2030, will be fossil-fuel free and have even higher environmental requirements than Hammarby Sjöstad. Both Hammarby Sjöstad and Stockholm Royal Seaport have shown not only Sweden’s determination in developing, marketing and implementing new energy and environmental solutions, but also the capability of creating sustainable and holistic city-planning systems using innovative environmental technologies and solutions that could be exported to, and applied in, many other parts of the world. How can Hong Kong fit in? The pressing needs to develop and adopt renewable energy and energy-saving technologies are providing numerous opportunities to further promote and strengthen tripartite cooperation between Hong Kong, the Chinese mainland and the Nordic countries. Indeed, not only Nordic countries are marketing their CleanTech know-how to Hong Kong and the Chinese mainland. More and more Chinese companies are either cooperating with Nordic technology companies to carry out research and development (R&D) activities in CleanTech fields or are participating directly in CleanTech projects in the Nordic region, demonstrating their eagerness to explore the international market. One recent example of such CleanTech investment includes a plan announced in February this year to invest €1 billion to build a new wood-based bio-refinery in Kemi, Finland by the Wuhan-based Sunshine Kaidi New Energy Group, which currently operates about 30 biomass plants in China and Vietnam. If its proceeds, it would be the biggest Chinese investment in Finland. Already a conduit of China’s outbound direct investment, Hong Kong can also serve as a centre to help Nordic companies source, screen and manage CleanTech investment from China, in addition to providing relevant professional services to facilitate investment. Hong Kong companies can also represent or help Nordic CleanTech companies in finding partners in Hong Kong, the Chinese mainland and other parts of Asia, connect them with relevant authorities and investors, and facilitate commercialisation, transfer and licensing of relevant research results and innovations. As companies from both the Chinese mainland and Nordic countries show increasing interest in sharing expertise and cooperating on R&D activities, Hong Kong companies should enhance their promotional efforts in the Nordic region to showcase the value they can add to this process. In fact, Hong Kong is no stranger to Nordic CleanTech companies, many of which have either had experience with projects or have had business representation in the city. For instance, Envac, a leading Swedish CleanTech company and the inventor and major supplier of automated vacuum refuse-collection systems (the ones used in Hammarby Sjöstad), operates a wholly owned subsidiary in Hong Kong to provide technical support to its projects across the border. The company has also carried out various projects in the city for the Hong Kong government, the Hong Kong Housing Authority, the Science and Technology Park, HSBC, Hong Kong International Airport, and Adventist Hospital. The success of these Nordic CleanTech companies has strengthened Hong Kong’s role in showcasing how innovative environmental technology from leading Nordic countries can be applied to a small, crowded city. Hong Kong can also become a role model to other Asian cities in terms of the integration of economic growth with environmental awareness and increasingly tough green standards. Last but not least, as a crucial step towards activating private capital in the battle against global climate change, Nordic governments and financial institutions including Swedish corporate bank SEB – the underwriter of the world’s first green bonds issued by the World Bank in 2008 – have long been a driving force behind the global green bond market. Green bonds were identified during the COP21 Paris conference last year as a promising source of green financing for cities, regions and governments around the world, and closer cooperation between Nordic and Hong Kong financial institutions can contribute to the goal of providing US$100 billion annually by 2020 to support climate action in developing countries. For example, following the issuance of China’s first corporate green bond by Xinjiang-based Goldwind in Hong Kong and the publication of the world’s first official green bond guidelines – Green Bond Guidelines and the Green Bond Endorsed Project Catalogue – by the People’s Bank of China and the Green Finance Committee of the China Society of Finance and Banking on 22 December 2015, green bonds have quickly become a valuable item in the toolkit of Chinese CleanTech enterprises. Furthermore, to lay a strong foundation for a green, robust and resilient economy over the next two decades, China would need a minimum annual investment of US$350 billion (about RMB 2.3 trillion) over the lifetime of the 13th Five-Year Plan (2016-2020) to address its environmental problems, 85% of which would have to come from the private sector, particularly the debt market. It is widely believed that the new green bond rules will not only change the landscape of the global green bond market, which is currently dominated by players from Europe and the US, but that China’s big and growing demand for green financing will also provide a considerable advantage in developing and marketing Hong Kong’s status and strengths as an international financial centre. The Nordic region mainly consists of Demark, Finland, Iceland, Norway and Sweden. In this research report, Iceland is not covered given its small market size, while Norway is skipped due to its relatively narrow industrial base. The first European Green Capital was awarded in 2010 and seven cities – Stockholm (Sweden), Vitoria-Gasteiz (Spain), Nantes (France), Copenhagen (Denmark), Bristol (the UK), Ljubljana (Slovenia) and Essen (Germany) – have been awarded the title so far.